These intriguingly different bulbs deliver on their manufacturer's promises, but their design also limits their capabilities. If you’ve seen one LED light bulb you’ve seen them all, right? Not when that bulb is part of the BeOn Home Protection System. We first told you about this product when it was the subject of a crowd-funding campaign more than a year ago. Now that you can buy one, should you? I'll try to answer that question here. BeOn’s bulbs do more than produce light. Designed to operate in groups—forming a mesh network using the Bluetooth Low Energy protocol—they protect your home while you’re away by convincing would-be burglars that it’s an undesirable target. They pull off this trick by fooling intruders into thinking someone is in the home (I’ll explain how later). When you are home, the bulbs can help you escape danger by listening for your smoke and carbon-monoxide detectors and lighting your escape route if they sound off. The bulbs can produce 800 lumens at maximum, with a color temperature of 3000K to produce a warm white, similar to the familiar soft-white 60-watt incandescent bulb. Each bulb has its own battery backup, so they’ll continue to function even during a blackout. This also enables them to turn on and off regardless of the position the light switch that might otherwise be controlling them is in. 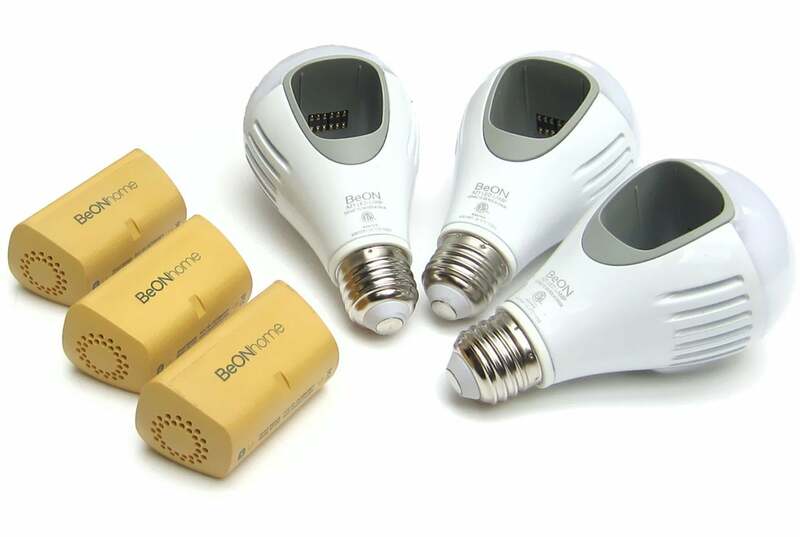 BeOn bulbs are larger than a standard incandescent bulb. One thing they’re not is inexpensive: A set of three bulbs costs $199, with add-on bulbs priced at $75 each. While that’s about the same price as a Philips Hue starter kit, add-on Philips bulbs cost only $60—and they can deliver color where the BeOn bulbs are soft white only. The Hue bulbs, on the other hand, can’t operate on battery power, and they don’t offer the same security features that the BeOn bulbs do. The BeOn bulbs can operate autonomously, too. Similar to the way a Nest Learning Thermostat learns your activity patterns to know when to heat or cool your home, the BeOn bulbs can learn to turn themselves on in a sequence. When you’re away and someone rings the doorbell, the bulbs will replay that pattern to deliver the impression that you’re actually home. If it’s a burglar, they’ll probably scram because an occupied home poses too much risk. But if they knock on the door instead of ringing the bell, the lights won’t do anything. I installed the bulbs in my small home’s living room, dining room, and basement. BeOn recommends that the bulbs be spaced no further than 160 feet apart, but they were more like 25 feet apart in my instance. If you decide to install these, be aware that the bulbs are somewhat larger than a conventional 60-watt incandescent; they won’t in tight spaces. I used BeOn’s iOS app to install the bulbs (the company released an Android version after I’d finished the review). Installation is pretty simple: You install the app on your smartphone, create an account, and then the app walks you through the rest of the setup process. The app discovers each bulb automatically and prompts you to assign a name to it when it’s discovered. But I encountered an issue during this process where I named a bulb, but when I tried to work with that bulb though the app, I discovered that I was actually controlling a different bulb. A better installation process might be to install, discover, and name one bulb at a time, instead of installing all the bulbs at once and then discovering and naming them. The rest of the setup process was problem free, though. The module containing the battery can be removed, and BeOn says its developing new modules that can enable the bulbs to perform new functions. BeOn’s app works well. You can control each bulb and its brightness individually, provided you’re within 30 feet of your home. Tap the Welcome Home button, and your lights will turn on and remain illuminated for three minutes—running on battery power if there’s a switch controlling them and that switch is in the off position. 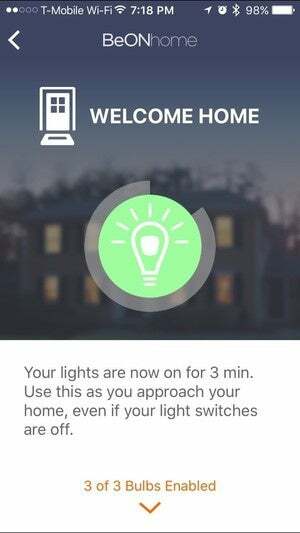 Tap the Welcome Home button on the app, and the lights will turn on for three minutes, giving you enough time to enter a dark home and then switch on the lights more permanently. In addition to turning on in response to the sound of your doorbell or smoke alarm, the BeOn bulbs will turn on and off according to the pattern you typically use them. Set the app to Away mode, and the lights will repeat these patterns to make it look as though someone is home when your house is actually empty—another great break-in deterrent. But you need to remember to set the app to Away before you leave, because there is no way to activate this mode once you’re out of range—you can’t control BeOn bulbs over the Internet. The app on your phone is the sole source of control over the bulbs. On the upside, that means you don’t even need to have a Wi-Fi router for the BeOn bulbs to do their thing. On the downside, sole reliance on your phone for control means you can’t schedule the lights to turn on and off in response to door or motion sensors you might have installed in your home. You also need to remember to turn Away mode off when you come back, or the patterns will continue to repeat when you’re home. 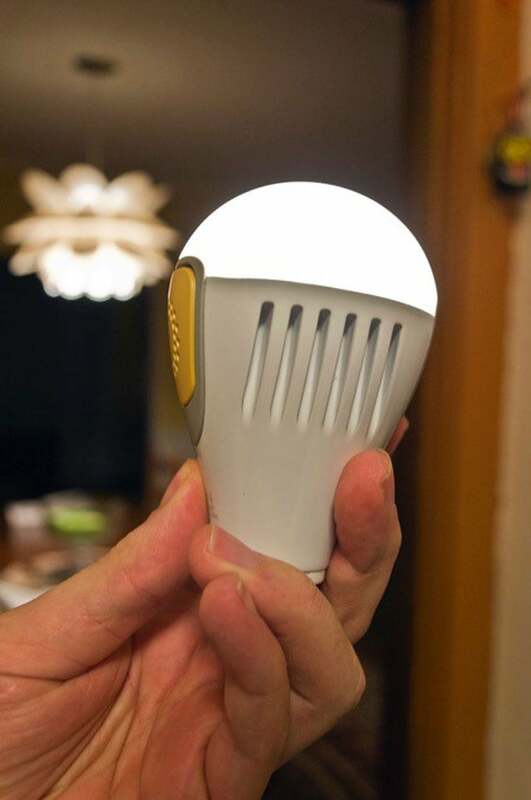 From their battery-power option to their ability to learn activity patterns, the BeOn bulbs are very different than the typical smart LED bulb. But not every difference is a net positive—the inability to control the bulbs over the Internet or to integrate them with other home-control systems are the two biggest negatives. I also encountered a few instances where the bulbs seemed to have something of a mind of their own, turning off by themselves and refusing to respond to commands from the app. But these problems were rare and were by no means showstoppers—and this problem occurred with only one of the three bulbs, so it might be defective. Flipping the light switch off and on again usually fixed the issue. I’ve reached out to BeOn to request a replacement. The most recent app updates have also seemed to be a little quirky at times, randomly giving me “Error” popups (with no explanation other than to “please try again later”). 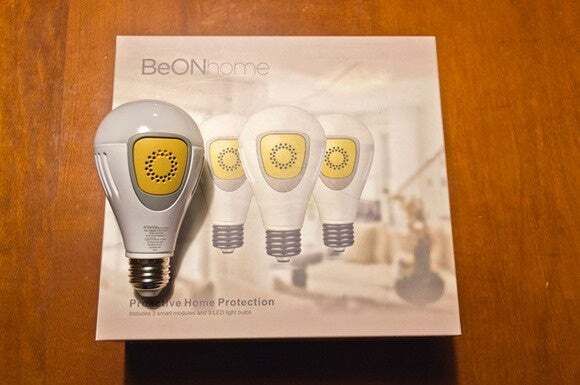 I’ve been happy with the BeOn bulbs despite these caveats—their theft-deterrent and safety benefits outweigh their occasional quirks. But I think most homeowners will want to install more than just three bulbs after they get a taste of what BeOn’s system is capable of. Even in my small home, three bulbs seemed too few to get the maximum benefit from BeOn’s innovative features.